“We continue to look for ways to improve coordination and response with our federal and local partners and, as directed by Governor Cuomo in his recent executive order, are evaluating the state’s spill prevention, response and inspection program for rail, ship and barge transportation of crude oil and other petroleum products,” said Emily DeSantis, the Department of Environmental Conservation’s spokeswoman. ~~~ NY Times 2/27/14 – end update]. That is shocking, because DEP regulates the NJ refineries that receive the oil shipments, and DEP has direct regulatory responsibility for those oil refineries and for protecting the Hudson River and surrounding NJ communities under numerous State environmental laws. But, there is another place where those risks should be assessed and protective strategies put in place: The NJ Hazard Mitigation Plan. That Plan has an entire Chapter 5.19 on risks from chemical and oil shipments, see: Risk Assessment – Hazardous Substances. The cities of Linden and Elizabeth, located on New Jersey’s highly industrialized northeast coast, are home to Conoco Phillips’ Bayway Refinery (formerly owned by Exxon). The northernmost refinery on the east coast of the United States, Bayway processes 238,000 barrels (10 million gallons) of crude oil per day. The crude oil is brought in by tanker ships from the North Sea, Canada, and West Africa. 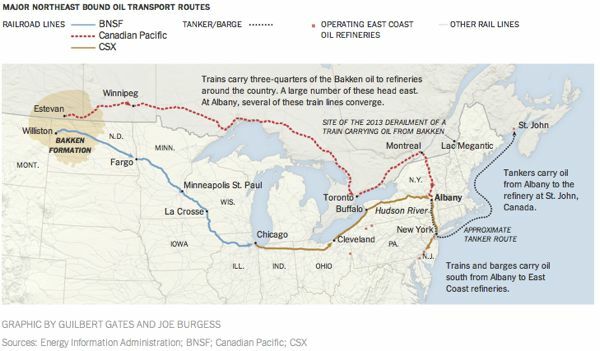 Once processed, 145,000 barrels of gasoline and 110,000 barrels of distillates per day are transported to east coast customers via pipeline transport, barges, railcars, and tank trucks. In addition, a petrochemical plant produces lubricants and additives and a polypropylene plant produces over 775 million pounds per year of polypropylene (American Littoral Society 2013). So neither DEP nor State Office of Emergency Management are aware of shipments of over 1 billion gallons of oil down the Hudson River? Or are they covering up that information? NJ Assembly Speaker Prieto needs to get the Legislature involved immediately in oversight of the Christie Hazard Mitigation Plan, as we’ve called for. 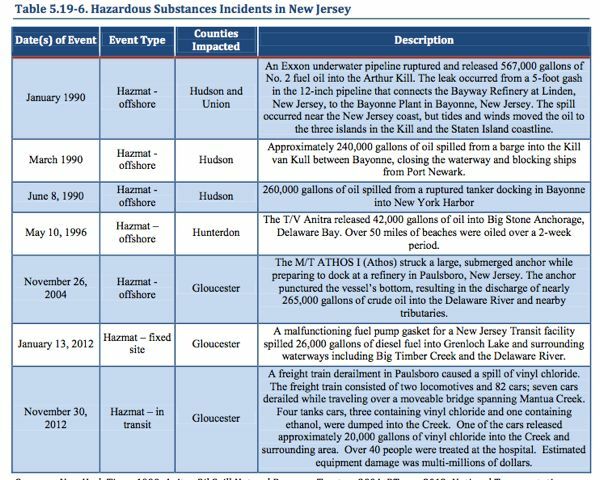 Significant hazardous substances occurring offshore are rather rare in New Jersey. As discussed in the Previous Occurrences section, several incidents have occurred over the past couple decades. While these incidents have been rather rare, New Jersey’s port systems and waterways are vast and the possibility for an incident does exist. Given the factors noted, past occurrences, and the State’s water network, the probability for future incidents in a given year is low. Aside from the general impacts noted with the fixed-site hazard, offshore incidents present unique challenges and secondary impacts. The secondary impacts associated with offshore incidents were witnessed in 2010 during the Deepwater Horizon spill occurring in the Gulf of Mexico. The incident had tremendous impacts on the environment, wildlife, and the economy. A significant incident would have a devastating impact on all of these sectors. A significant portion New Jersey’s economy is reliant on tourism, as well as near-shore and off- shore fisheries, thus an impact to the shore would be devastating. Hazardous substance incidents are non-natural incidents; therefore, there are no implications for impacts from climate change. In order to illustrate the problem of why sea walls don’t work and are discouraged, I’ve tried a variety of tactics. I’ve mocked Gov. Christie (as King Canute, trying to hold back the sea). I’ve summarized the literature and outlined the policies of other state coastal management programs to explain, highlighted by a dramatic photo – see: Memo to Gov. Christie: Sea Walls and Engineering Don’t Work. Like those other coastal states, sea walls used to be discouraged by NJ DEP’s coastal management program as well. But all that changed when “customer service” Commissioner Bob Martin took over and Gov. Christie got “drunk on federal dollars coming in” (that’s a verbatim quote from legislative testimony of former DEP Commissioner Mark Mauriello, a coastal expert). Engineered structures also are inconsistent with the recommendations of President Obama’s Sandy Rebuilding Task Force Report, the resiliency policy in new HUD regulations, and President Obama’s Executive Order on adaptation to climate change. But you don’t have to take my word for it – or Mr. Mauriello’s. Historically, some of the methods used by municipalities and property owners to stop or slow down coastal erosion or shoreline change have actually exacerbated the problem. Attempting to halt the natural process of erosion with shore parallel or perpendicular structures such as seawalls (groins and jetties) and other hard structures typically worsens the erosion in front of the structure (i.e. walls), prevents or starves any sediment behind the structure (groins) from supplying down-drift properties with sediment, and subjects down-drift beaches to increased erosion. Since most sediment transport associated with erosion and longshore drift has been reduced, some of the State’s greatest assets and attractions – beaches, dunes, barrier beaches, salt marshes, and estuaries – are threatened and will slowly disappear as the sediment sources that feed and sustain them are eliminated. It appears that some folks along the shore clearly understand all that, because public opposition is growing to DEP’s proposed $40 million 4 mile long sea wall along the shore of Mantoloking. 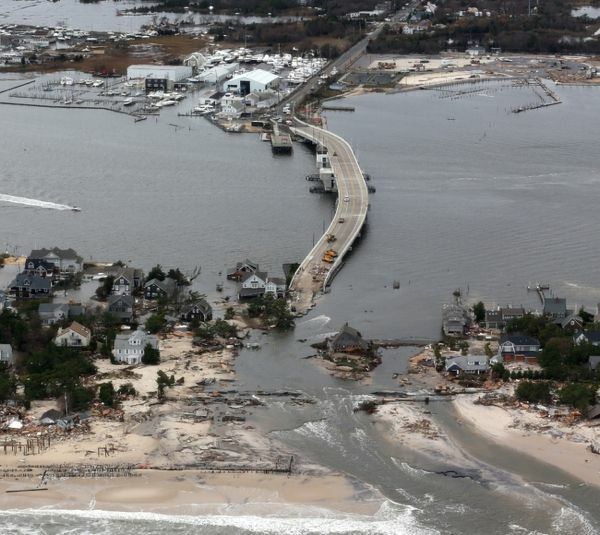 The ill conceived project – rammed through by transportation engineers just days after Sandy cut through the barrier island and washed out Rt. 35 and the Rt 528 bay bridge – has suffered a series of snafu’s and setbacks. When asked why the temporary wall is being dismantled before bids have even gone out for the permanent structure, Greeley said the removal is at the request of oceanfront property owners who have the right to get on their property and that the underground portion of the temporary wall will still be in place to help stabilize the beach. MANTOLOKING — A mistake at the state Department of Environmental Protection in which written comments on the planned borough sea wall were sent to the wrong address in Trenton is forcing state officials to extend the comment period and to delay the start of the project. They contend it won’t be much more than a week’s difference. Let’s hope that this latest set back can provide time to allow adequate consideration and public opposition to grow and kill the project. DEP is far to “drunk on federal funds” and under the influence of the outdated thinking of coastal engineers to change course. It will take an external intervention to stop this folly. Christie and Cuomo – Partners in Crony Corruption? I’ve been closely following the $500 million BL England power plant and Pinelands pipeline controversy and knew that Rockland Capital (owner of BL England) was from New York State, but, because I focus on the Jersey side of the river, I had no idea that the behind the scenes lobbying and political deals involved in the project were linked to powerful NY players. Award winning investigative reporter Wayne Barrett connects those dots in a must read killer story today in the New York Daily News. But our backyard is, like Samson’s two-state Port Authority, overrun not only with Christie underbrush, but with connections to that other master of the multi-billion-dollar Authority, New York Gov. Andrew Cuomo. Rockland’s chairman is Michael Del Giudice. He oversaw Andrew Cuomo’s transition committee in 2010, just as Samson chaired Christie’s in 2009. Del Giudice, the lead independent director at Con Ed, was chief-of-staff to Andrew’s father, former governor Mario Cuomo, and more recently, the elder Cuomo has been an investor in and chairman of a Del Giudice banking company. Rockland is run out of the same Carnegie Hall Tower office as a state scholarship fund that Andrew Cuomo named Del Giudice to lead. Rockland’s vice-chair is Jerry Crotty, who once was counsel and secretary to Mario Cuomo and is now the president of an investment firm that owns more of Rockland than any other investor. When Rockland acquired the plant for a $12 million pittance in 2006, it promised DEP it would complete the mandated expensive, pollution-reducing retrofitting that prompted the prior owners to sell. It also hired Tony Burgos as its lobbyist. Burgos is another former top Mario Cuomo assistant whose installation years ago as Port Authority vice-chair positioned him to become the connected bi-state lobbyist he is today. Burgos, Crotty and Del Giudice are major Andrew Cuomo donors and fundraisers, accounting for hundreds of thousands in contributions over the years (they do not give to Christie). There is no indication that the Cuomo administration has done anything to benefit Rockland, which does have New York operations. Perhaps Cuomo and Christie have shared friends and/or shared interests – and perhaps some intrepid investigative reporters out there will begin looking into those connections. [End Note: I am extremely pleased that Barrett got the BL England enforcement story right. The NJ press corps has missed that or given the Christie DEP a pass on how they not only extended the compliance deadlines in prior DEP enforcement Orders, but shifted the focus from shut down or upgrade the pollution controls at the plant, to promoting repowering of the plant. 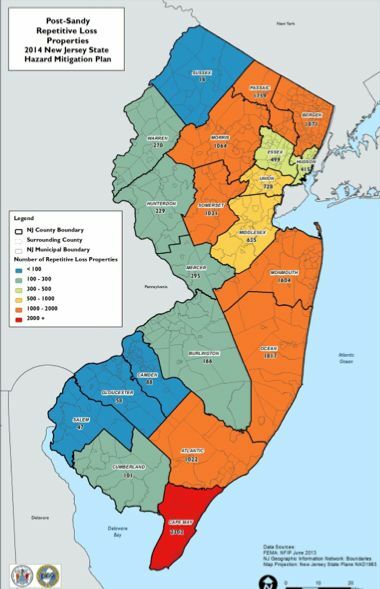 New Jersey’s guaranteed right to rebuild following storm damage stands out as a highly unusual provision, according to a Huffington Post review of coastal laws in more than a dozen states on the Atlantic and the Gulf of Mexico. North Carolina, for example, generally bars rebuilding in the same place after a structure is substantially damaged by a storm. Florida and Alabama typically require state reviews before approving the rebuilding of coastal structures damaged in major storms. Several other states, including South Carolina and Maine, require that property owners pull back from the ocean as much as possible following hurricane damage. Experts describe New Jersey’s express right to rebuild as the single most significant impediment toward limiting the state’s vulnerability to future storms. A bill (S62 – Barnes) that would rescind the so called “right to rebuild” storm damaged property in NJ’s Coastal Zone was approved by the Senate Environment Committee last week, with surprisingly little debate or opposition. Republican Senator Thompson opposed the measure. 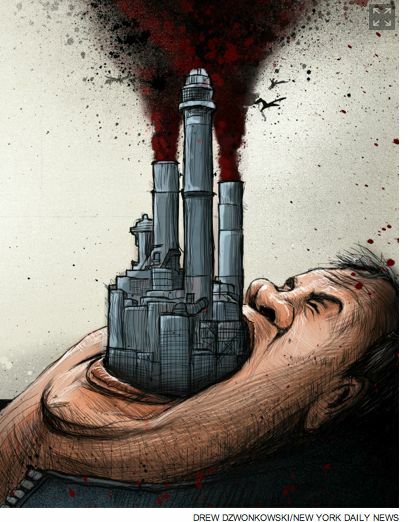 He said it would create more bureaucracy and red tape and interfere with rebuilding. The bill was supposed to be a companion to Senator Barnes far more ambitious bill (S64) to create a Coastal Commission. That bill would reduce the CAFRA review threshold from 24 units to just 3 residential units. The Right-to-Rebuild bill’s effectiveness is severely limited as a stand alone measure, because it would apply to very few properties. It makes little sense to revoke the storm damage rebuild exemption without closing the CAFRA 24 unit loophole. The CAFRA “right to rebuild” permit exemption, working in tandem with the CAFRA 24 unit loophole, strongly encourages rebuilding of storm damaged properties in the same footprint and in the same vulnerable location. There are approximately 245,806 NFIP policies in New Jersey. Of those policies, 16,017 are considered repetitive loss (RL) and 2,097 are considered severe repetitive loss (SRL). So, just 6% of the properties create the large majority of the repetitive loss problem, with less than 1% severe repetitive loss. Obviously, those properties hold not be rebuilt and should be targets of acquisition. But, the Christie Administration’s “Blue Acres” and HUD CDBG acquisition plans are not specifically targeted at those repetitive loss properties. So, current policy provides a big green regulatory exemption light to rebuilding in hazardous locations and does not target the most hazardous locations for acquisition – the worst of all worlds. Typically Christie incompetent governance. Making matters even worse, these vulnerable repetitive loss properties are not all located along the coast in the CAFRA zone. See the map above and note that the majority are inland and at risk from river flooding, not coastal flooding. Which takes me to my testimony on the bill. CAFRA is not the only state law that allows and encourages rebuilding of flood and storm damaged property. The Flood Hazard Area Control Act, which protects against river flood risks, contains a permit exemption very similar to CAFRA. No rule or regulation adopted pursuant to section 4 or 7 of P.L. 1972, c. 185 (C. 58:16A-55 or 58) shall prevent the repair or rebuilding within a flood hazard area of any lawful preexisting structure which was damaged by a flood or by any other means. Homes that are damaged or destroyed by river flooding may be rebuilt without having to secure a DEP flood hazard permit. That makes little sense and contributes to the repetitive loss problem. So, I requested that the bill be amended to make the proposed policy under CAFRA uniform across the state. Why should the reconstruction of storm damaged properties along the coast be subject to CAFRA permit requirements, while the rebuilding of storm damaged inland properties are exempt from permit requirements? Chairman Smith stated that he had discussed my proposed amendment with the sponsor, Senator Barnes, and they agreed that it would significantly expand the scope and applicability of the bill. Smith then stated that the CAFRA bill would apply to virtually no one – after which he summarily rejected my proposed amendment. Why waste time passing a bill that would apply so narrowly and have very little impact on the problem? The Senate Environment Committee heard S151 yesterday, and re-engaged the RGGI debate, just 2 days after a NJ court Ordered the Christie Administration to reconsider the Governor’s unilateral decree to leave the RGGI pact without complying with public rule making procedures. The Court’s decision was another rebuke to the Gov.’s abuse of executive power – and the Court gave the Administration just 60 days to comply. The bill – co-sponsored by Senate President Sweeney – is another political challenge to the Gov.’s decision to leave RGGI. Whether the bill represents a real challenge of the Gov.’s abuse of executive power and a legitimate greenhouse gas emissions reduction effort remain to be seen. The last thing we need at this point are partisan stunts. During the hearing, Chairman Smith had fun with Doug O’Malley of Environment NJ, one of the successful plaintiff’s in the lawsuit that led to the Court’s decision. O’Malley played the Cheshire Cat, but perhaps prematurely, as the Court’s Order could turn out to be a Pyrrhic procedural victory, a point the Chairman’s later question “What happens if DEP proposes a regulation to exit RGGI” clearly brought out. I had not planned to testify, but felt compelled to testified to clarify a few issues. Again, unfortunately, I was forced to agree with Governor Christie regarding RGGI impacts on emissions from the power sector. RGGI simply does not provide incentives or enforceable regulatory sticks to reduce emissions from the NJ power sector. Just the opposite – it locks in and allows significant increases to current emissions. And RGGI certainly does very little to implement the goals of the Global Warming Response Act, which require an 80% reduction by the year 2050. During the few years it operated, RGGI allowances sold at the statutory minimum and the program generated about $50 million per year to fund energy conservation, efficiency, and low income consumer subsidy programs. Those are great programs that provide great benefits, but the small emissions reductions they provide can be secured by other existing programs funded under the far larger Societal Benefits Charge ($400 million/year). Those programs can be mandated by BPU under the existing laws governing energy efficiency and renewable energy goals, and NJ’s renewable portfolio standards. We don’t need RGGI to authorize or fund those programs. Far larger pots of money and legal leverage exist to fund and mandate far larger emissions reductions. So the RGGI program’s justification should focus exclusively and be grounded in far larger potential emission reductions from the power sector. And from that perspective, the program fails badly. Power sector emissions reductions are far more significant than the small reductions that result from RGGI funded conservation, efficiency, and consumer subsidy programs. In addition to failing to make these critical distinctions between energy demand and supply and the various suite of programs that should target each (and who should pay and how those programs should be financed), I wonder whether the environmentalists who supported the bill read it. “consistent with the terms of the Memorandum of Understanding signed by New Jersey and other states on December 20, 2005″. The so called pollution cap under that 2005 MOU agreement is at least 35% above current emissions. The bill will result in the OPPOSITE of what it claims: instead of providing incentives to reduce current emissions, it will provide incentives to increase them. If the Legislature were serious, they would require that as a condition of NJ rejoining RGGI, that the cap be reduced so that real reductions occur based on current emissions. And they would put a number into law, say by 35% – and put the total NJ emission allowances in the bill to make them enforceable. It is my understanding that the RGGI states are already engaged in negotiations to reduce the current cap, so this issue must be addressed by NJ policymakers anyway (assuming NJ were to re-enter RGGI). 2. As I testified, EPA is scheduled to propose regulations under the Clean Air Act to reduce greenhouse gas emissions from existing power plants in June 2014. The Natural Resources Defense Council is suggesting that those EPA rules could reduce current emissions from existing plants by 21 – 31%, based on 2012 baseline emissions. One compliance option under those rules may be participation in RGGI. So this begs the question: which program will reduce NJ emissions deeper and faster: the EPA rules or the RGGI program? How do those reductions compare with NJ’s GWRA 80% reduction goal? So, before deciding whether to rejoin RGGI, state policymakers should be informed by a side by side analysis of RGGI versus the Obama EPA rule, in terms of total emissions reductions over time and the ability to monitor and enforce those reductions. Again, if the legislature were serious about reducing emissions, then this would have been considered openly – before I had to raise it – and the Chairman would have formally requested that DEP perform that kind of side by side emissions analysis. While I am not optimistic that the Obama EPA rule will be aggressive, particularly as applied to NJ which has a relatively low carbon energy infrastructure due to lots of nuclear power, at a minimum sound policymaking demands that side by side comparison. Such a comparison would also hold the Obama EPA accountable and dispel the myth that the administration is engaged in a “war on coal” and test whether the Obama EPA is serious about using a big regulatory stick to reduce GHG emissions to respond to the climate crisis. Ironically, the EPA regulation – which would apply nationally and in carbon intensive places like Pennsylvania – would eliminate the business community’s criticism about “leakage” and uncompetitive energy policy that discriminates against lower carbon higher cost NJ power. In another irony, RGGI was created as an incremental regional state program to spur national action in Congress on a federal market based cap/trade program. That market based approach has failed in Congress, and the Obama EPA is committed to a regulatory strategy. So, we also need to rethink not only the numbers, but the fundamental policy choice of a market based or regulatory approach. I’m a regulatory mandate advocate – the only proven approach. But not of the NRDC backed “flexible, cost effective, state partnership based” variety of regulation. No way carbon intensive states make any real commitments without a huge federal EPA regulatory stick.